2,500 Pensiangan folks cut off | Daily Express Online, Sabah, Malaysia. 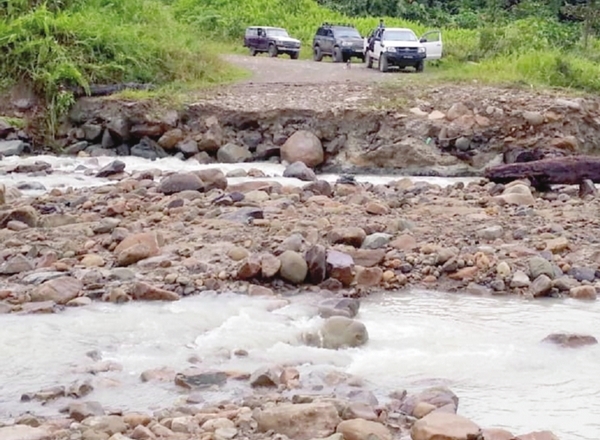 Keningau: Some 2,500 residents in the Pensiangan area were cut off when the road that became their main route collapsed due the Kerlin river overflowing and causing flooding there.Pensiangan Native Chief Zainuddin Yampat Tahol told Daily Express Thursday that the road was no longer accessible to all types of vehicles. The road built across the the river was the main route for road users and residents in the area. "When the flood hit the Kerlin river at about 8pm on Wednesday, the river bank collapsed and the roads were swept away and the cliffs became high. Zainuddin said the road was the main communication to Nabawan town, Sepulot and Pensiangan town and the distance from the scene to Nabawan town was 70km. There are four schools in the area, namely SK Pekan Pemsiangan Komprehensif 9 (Pre-school to form three), SK Salinatan, SK Sibangali and SK Saliliran besides a Health Clinic. "The location is mid-way between Sepulut and Kampung Sibanait and within the forest area. There is no other alternative road that can be used by residents to Nabawan town," he said. Zainuddin recalled that in 2012 a teacher had asthma and could not be saved because of late treatment at Nabawan Clinic and Keningau hospital because at that time the Sibanait river was flooding and inaccessible. He did not want the incident repeated and urged the new Warisan-led government to build a concrete bridge to facilitate safe travel for residents of Pensiangan. At the same time, he also called on the Government, especially the Public Works Department, to repair and reconstruct the collapsed road to facilitate road users because it is the main route for the residents in Pensiangan.